The Neve Şalom Synagogue, whose name means "Oasis of Peace," brings to mind old times and faraway places. The Neve Şalom Synagogue, whose name means “Oasis of Peace,” brings to mind old times and faraway places. By 1935, with the increase in the Jewish population around Galata and Beyoğlu, the capacity of the Kenesset and Zülfaris Synagogues was no longer adequate to accommodate the needs of the community. Various spaces around the city needed to be rented and used as temporary houses of worship, particularly on major religious holidays. In 1938 permission was granted to the community to combine two existing Jewish primary schools on Büyük Hendek Caddesi and after appropriate changes were made to the girls’ school assembly hall, it opened as a space for religious worship. On April 24, 1948 the Galata-Beyoğlu congregation decided to found a new synagogue with the name of Neve Şalom and to refer to the converted space by this name. In July of 1949 the congregation presented plans to construct a new building and received permission to build. Two young Jewish men, recent graduates from Istanbul Technical University – Elio Ventura and Bernard Motola – presented their own proposal for the building’s construction after six months of arduous preparation, arguing that only those who felt and understood the meaning of the place would be able to come up with a satisfactory design. The two youths were taken onto the project. The Neve Şalom Synagogue opened in its new location on Sunday morning, March 25, 1951. The Chief Rabbi Rav Rafael Saban expressed his wish on its opening that it would be “not only a place to pray, but a place where the rich and poor, the young and old, the ignorant and the learned could gather and meet in a spirit of brotherhood and sincere equality.” Later a four-story building in front of the synagogue was purchased and demolished, and the construction of the front of the synagogue was completed and new doors added. With its countless religious ceremonies each year (weddings, Bar-Mitzvas, funerals, etc), Neve Şalom also celebrated a number of important historical events which occurred over the past half-century and which should be touched upon. On March 2, 1953 the induction ceremony of the first Chief Rabbi chosen during the Republic era, Rav Rafael Saban took place. The induction ceremonies of Rav David Asseo (December 7, 1961) and Rav İzak Haleva (December 19, 2002) also took place here. On September 6th 1986, on a Saturday morning at 09:17, foreign terrorists attacked the synagogue with bombs and machine guns. Within 2-3 minutes 25 people who had gathered to worship and take part in their religious obligations lost their lives. After a sorrow-filled funeral ceremony on September 10th, the dead were buried in special part of the Ulus Ashkenazi Cemetery. After undergoing a short period of repairs, the synagogue was reopened with a special ceremony on May 20th, 1986. The historical clock in its courtyard has been stopped at 09:17 – the time of the sinister attack – and a nearby marble block stands engraved with the names of the all the victims. Moreover two corners of the building have been left unrepaired, with shrapnel and bullet marks still showing, as a memory of that day. On March 1st, 1992, on a Sunday Afternoon, two terrorists were stopped by security and were arrested before any harm was done. 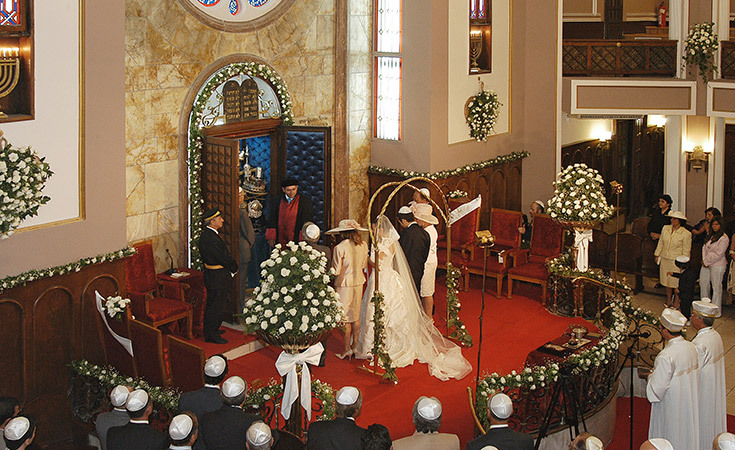 On November 15th, 2003, at 09:14 in the morning, a bomb exploded on Şişhane Büyük Hendek Caddesi and two minutes later in front of the Şişli Bet İsrael Synagogue. Six Jews and eighteen Muslims – a total of 24 people – lost their lives. Hundreds were wounded. Damaged in the attack, the Neve Şalom did not open its doors again until July 29, 2004. Its official reopening took place on October 11th, 2004. On March 4th, 1992 a very important ceremony took place here. A prayer of thanks was offered to the Turkish nation on the 500th anniversary of their acceptance of the Sephardic Jewish refugees who had been driven from their original homes into these new lands. 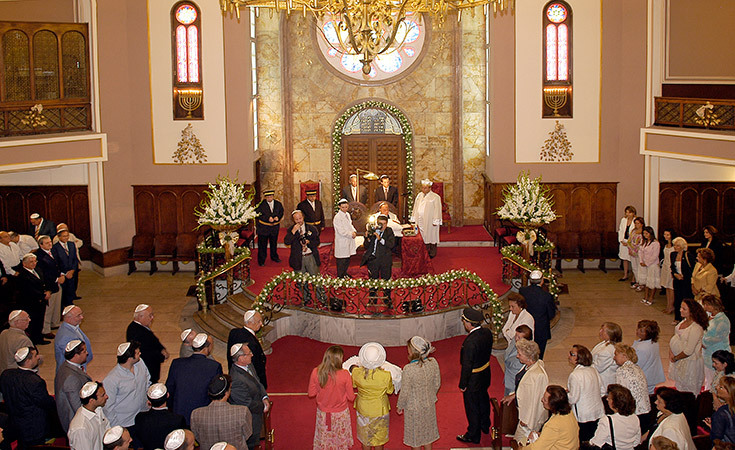 The Neve Şalom Synagogue also celebrated historical days on October 26th, 1998 when it commemorated the 75th anniversary of the founding of the republic, and on October 3, 2002 when it celebrated the 50th year since its founding.